I woke up this morning feeling pretty good about myself. Yesterday, I finally completed a day hike surpassing both the distance and gain requirements to ascend Mt. Whitney via the Mt. 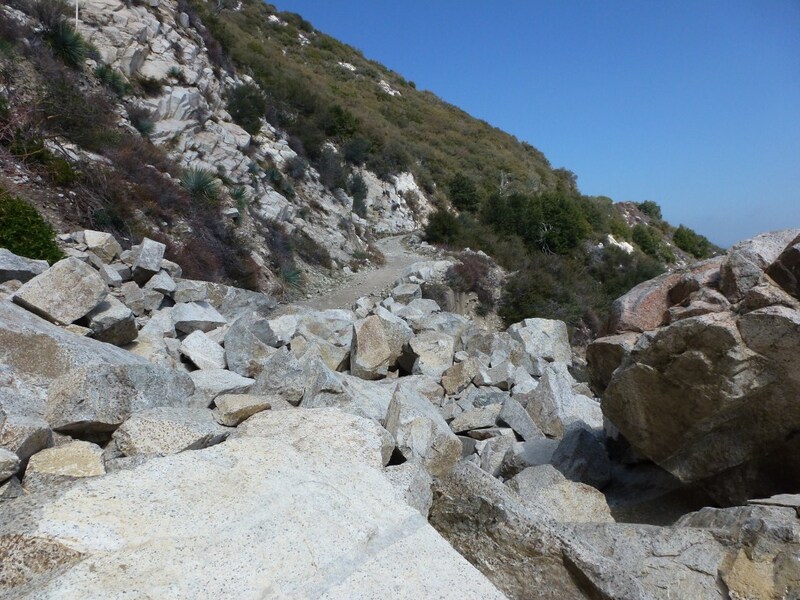 Whitney Trail–this one just over 25 miles and 6,600′ of gain. I started from the Cobb Estate. The hike I planned to do was one I’d already done with a minor extension along a trail I’d also already done. 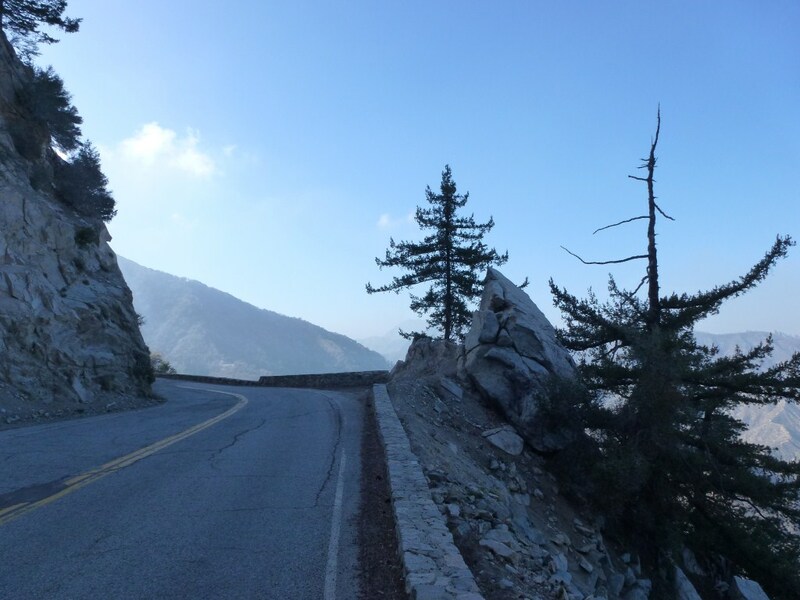 While going up to Inspiration Point via the Castle Canyon Trail from Echo Mountain, I kept thinking about how I really wanted something different. Granted, this was a training hike and distance and gain were more important than exploration and taking pictures. However, I just don’t respond well to repetitiveness. If I wasn’t going to do something new, I wanted to figure out how I could at least retrace as few steps as possible. From Inspiration Point I headed down to Idlehour Campground and by the time I reached the stream I’d decided I would try and do a loop by going up to Mt. Wilson. I met another hiker (Rolin) who is also training to hike Mt. Whitney at Idlehour Campground. We hiked up to Mt. Wilson Toll Road together. Hearing Rolin talk about numerous different places he’s hiked and camped in several states only served to reinforce my decision to hike a loop instead of retracing my steps. So, at Mt. Wilson Toll Road I said good bye to Roland and headed up toward Mt. Wilson. As I hiked up Mt. Wilson Toll Road, I realized I really was operating with multiple plans. 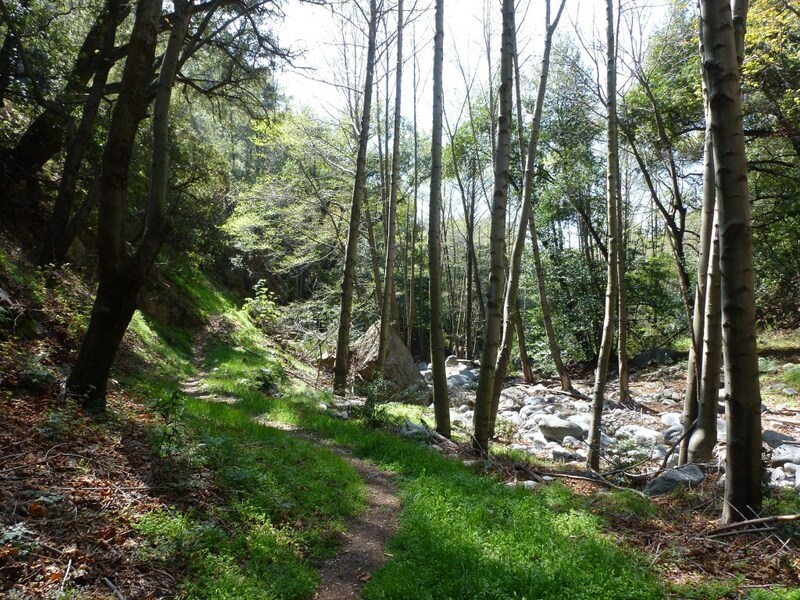 My original plan was to hike down to Henninger Flats and return the way I came. By going up, I had just ditched that plan. Up meant several miles more than the planned hike–a distance I’d not done before. So, I worked out several scenarios based around things like at what point I would pass the physical ability to return via Idlehour–Mt. Wilson was past the halfway point of a loop. Time was also an issue as I wanted to make sure I at least made it to Inspiration Point before I had to use my headlamp. The time issue turned out to be a good thing as it caused me to hike quickly and therefore generated a better training pace. Once I decided to continue up past the junction with the Mt. Wilson Trail, there was no turning back. I knew I had plenty of time to get to Inspiration Point before dark, and physically I was feeling great. I wasn’t much looking forward to the segment of hiking down the paved Mt. Wilson Road for 2-1/2 miles. However, that tuned out better than expected and there were some nice views along the way. By the time I hit Eaton Saddle, I was hiking at a good pace and knew I no longer needed to worry about time. 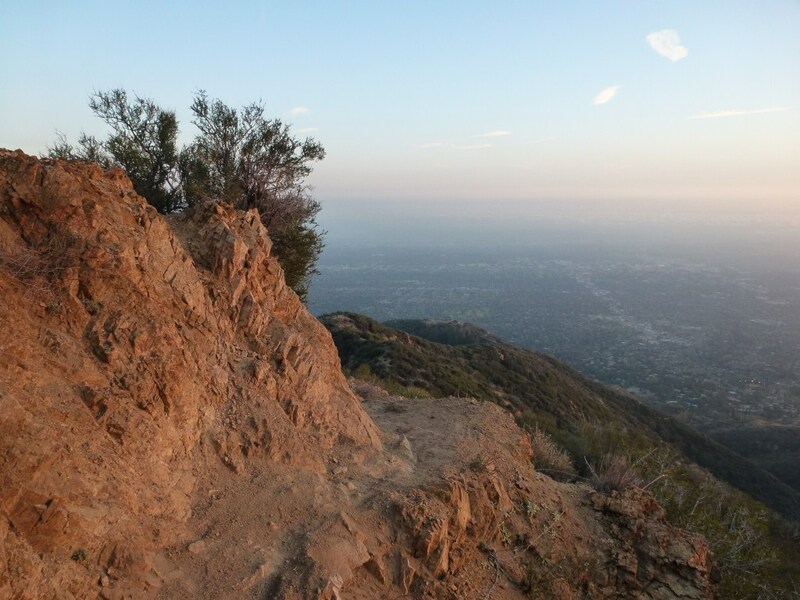 From Eaton Saddle I passed through Mueller Tunnel–also passing a couple of young women doing a performance art piece–and made my way to Markham Saddle enjoying the view down Eaton Canyon and reflecting upon how far I’d traveled. From Markham Saddle I trekked past Mt. Markham and Mt. Lowe taking the North and East Mt. Lowe trails down toward Inspiration Point. I took the Middle Sam Merrill Trail down to Echo Mountain and enjoyed watching the sunset while making it to Echo Mountain before dark. 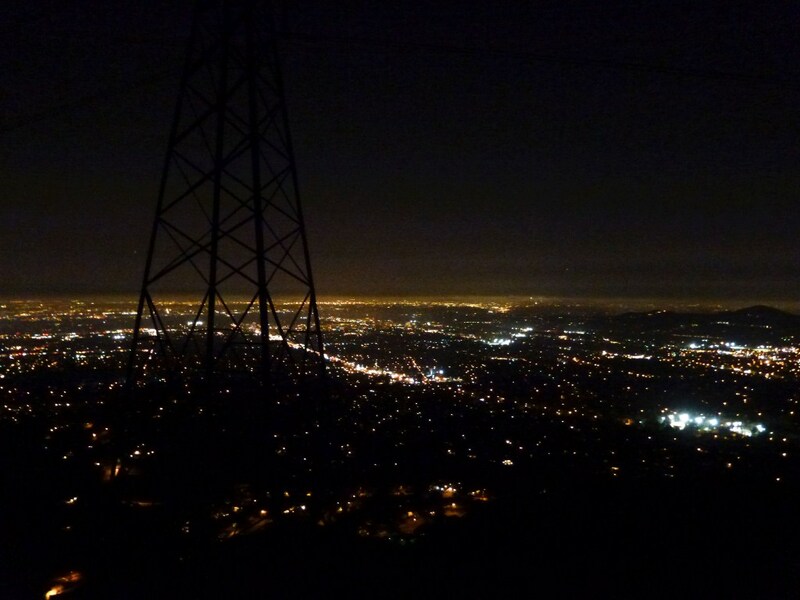 After leaving Echo Mountain, I didn’t need to break out the headlamp until about halfway back down to the Cobb Estate. I like that the city lights also provide light on the trail–which turned out to be extra helpful as the white bulbs on my headlamp burned out and the red bulb wasn’t that bright. Also, I saw more people coming up the trail at night than I saw the rest of the day combined. This entry was posted in Hike Report and tagged Angeles Forest, Hiking, Mt Whitney Training by Kyle Kuns. Bookmark the permalink. Great write up. I too am training for Whitney, just for notification that 2 of my friends both won the lottery for Whitney so now I have 2 chances to climb it, one in July and another in August. We’re doing it as a day hike so its going to be a big challenge! Keep up the training and good luck! I won the lottery for August. I’m going to start adding training hikes that have at least the distance or elevation gain to this blog soon and add new ones every week or two. Good luck to you too! So i’m looking forward to reading your blog for more ideas on training hikes. Right now i’m working on distance but the high elevation hikes is where I will really be able to see where I stand. Can’t wait for the snow to melt. Gorgonio baldy and Jacinto are calling my name! That looks like a great hike. I’m also working on distance and gain right now. Are you day hiking or backpacking? I have 3 days but will be in condition to day-hike if weather is bad. I’m doing it as a day hike. I would like to do is as an overnight trip as well. I guess I’ll see if i am successful in doing it as a day hike. If not, I’ll give myself more time to reach the summit on my next trip. Great job on the blog Kyle, enjoyed it. I too long to do Whitney, but may approach it from a section on the JMT. Hiking is an awesome way to clear the mind, isn’t it? Awesome! Mt. Whitney is one of my goals as well. Although, right now we are focusing on the Yosemite trip, I am thinking I may reach Mt. Whitney by way of completing the John Muir Trail in the next few years. The John Muir Trail is on my list as well. If I’m feeling ambitious (and can find someone like minded to join me), I’d like to finish off that hike by going down the High Sierra Trail instead of going down Whitney Portal. Good luck on Half Dome. It looks like your training is on the right track. Very neat. Great shots. Great story. Go Kyle!